The ancient city of Reggio Calabria, Italy, has an ideal climate, with Mediterranean winds on one side and and cool mountain ranges on the other, it has been home to the bergamot tree for nearly six centuries. 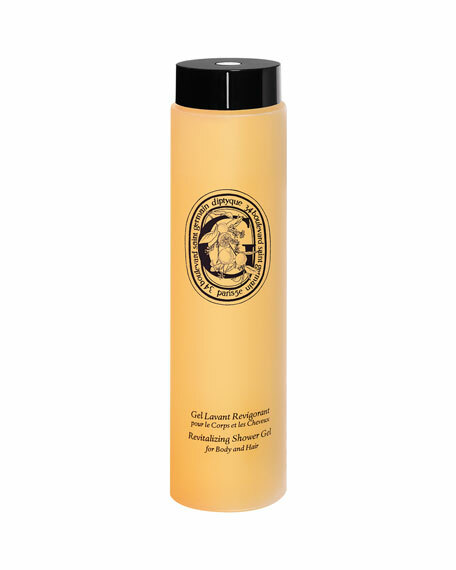 A 2-in-1 cleansing gel that lathers to a light foam that refreshes the body and hair with the fresh scent of bergamot. A fusion of freshness is created with bergamot, green mandarin, and honeyed rustic neroli. Peppermint oil invigorates the skin. Almond extract revitalizes hair, adding volume and shine. Wheat oligopeptide soothes the scalp and strengthens the hair. Diptyque Body Care formulas contain no parabens, phthalates, artificial colors, TEA, DEA, PEG, PPG, silicone, aluminum, or sulfates.